By "collateralized," I'm referring to the concept of "marketing collateral," a concept I became familiar with in my years working at Paradise Corporation (my private pseudonym for ARAMARK). For a person to be collateralized means for a person to be used for marketing purposes, I guess. I have been "collateralized" twice before, in 2009 at LBridge, and in 2012 at Karma. So recently Curt hired a new marketing service for his hagwon, and a very dorky picture of me was used in some newpaper advertising copy. One of my students saw it and gravely shook her head, saying, "Don't be too proud of that picture, teacher." I'm inclined to agree. I look like a doofus with an alligator fetish. Maybe that's not so far from the truth. 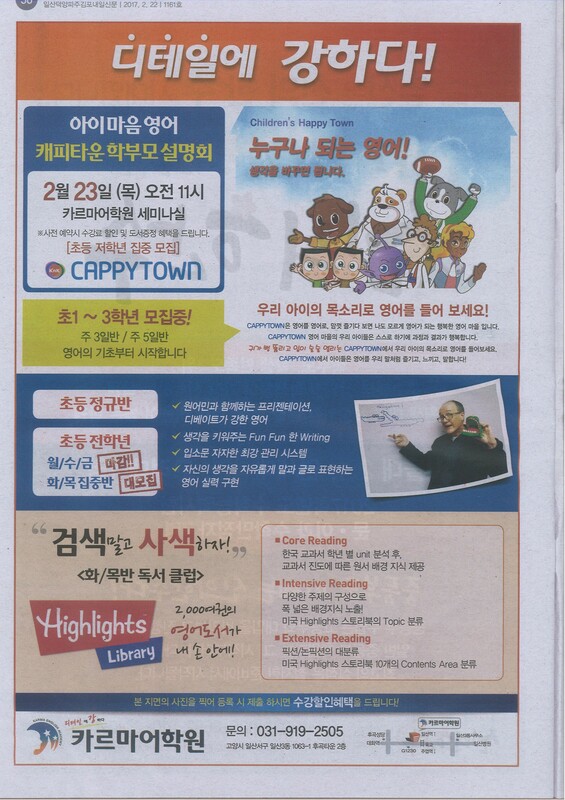 Here is a scan of the newspaper page in question – it's one of those local newspaper advertising circulars that are one of the most common ways for hagwon to adverstise. So they complain about your unorthodox (by Korean standards) teaching methods, but when it comes time to advertise the hagawon, they realize that your engaging teaching is what’s going to attract new students. Typical. I think you should be proud of the photo and what it represents!